Update: This event was rescheduled to December 7th, 2012 because of Hurricane Sandy. As a lover of single malt Scotch whisky and a lover of The Morgan Library & Museum, I'm going to take the unusual step (for me) to post about a coming whisky event and urge everyone to come, if they can. I'll be at this event (and some other interesting whisky people too, if I have my way). I have a particular vested interest in this event because it will be the very first whisky event at The Morgan and the second one at this venue will be the first public whisky event I'll be leading. I'm thinking it will be a whisky-chocolate pairing event. If these events succeed The Morgan might become a regular venue for whisky events - which would be grand. It's a great room in a fabulous Beaux Arts masterpiece of a site. A few words about Gordon & MacPhail and the selections that will be offered. Gordon & MacPhail (G&M) is the oldest independent bottler in Scotland and has legendary warehouses in Elgin where a century's worth of incredible casks from all over Scotland rest. G&M has bottled the oldest and rarest whiskies. There are a number of distilleries (such as Miltonduff and Mortlach) that are impossible to obtain except by G&M issues. G&M also owns its own excellent distillery, Benromach, to boot. Recently US sales got to the point that G&M's US distributer hired a North American Brand Ambassador to evangelize G&M's products: Chris Riesbeck. 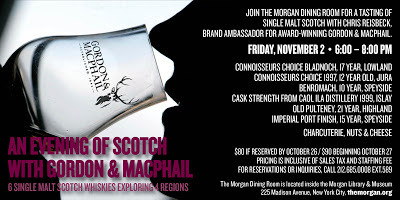 Chris will be at The Morgan to pour some extremely rare and fascinating drams. Among them, Bladnoch is a rare Lowland distillery that closed and was recently reopened. This selection is of the dwindling stocks of the old stuff. Imperial is a Speyside distillery that closed in the 1990s and has been the topic of intense discussion in the whisky community lately because of rumors that Chivas might rebuild it. Even if they do, however, it will be a new distillery inside the shell walls of an old ruined one and the Imperial whisky that Chris will be pouring comes from the dwindling stocks of a vanished beloved departed. All of these selections are special and worthy of note. It should be a terrific evening in a special venue. Join The Morgan Dining Room for a tasting of six fabulous single malt Scotches from four different regions with Chris Riesbeck, Brand Ambassador for award-winning Gordon & MacPhail. 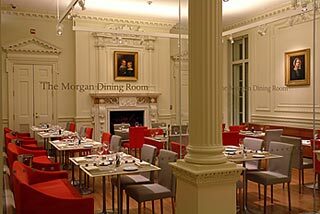 The event will be held in the historic Morgan Dining Room located in the 19th century Morgan House mansion - former home of JP Morgan Jr. at The Morgan Library & Museum. This will be the first whisky event at this storied venue. This sounds fantastic! I've heard from two reliable sources that G&M's OP21 is grand. And old Bladnoch! I'm totally on the wrong coast. As winter descends I'm not so sure living in California is the wrong move (but full disclosure I was born and raised in Berkeley). I poured G&M at the recent Whisky On The Hudson event (a post coming soon on that) and I tasted half a dozen G&M bottlings. I recently posted on the G&M Miltonduff 16 (glorious). I've also recently reviewed a 1984 G&M Caol Ila, and a Linkwood bottled in the early 90s. They are really an excellent independent bottler. I swear I haven't had a bad one - pretty much ever. I wish you were coming MK! I'll be sure to take good notes. With the Morgan still closed (as of today) in the aftermath of Sandy, is this still going to happen? Thanks for posting the question, Wrenn. The event is being rescheduled. I'll post information when I get it. Updated. Event is rescheduled from 11/2 to 12/7/12.